Local sellers OutSell their products and services to a global virtual wholesale network. Globalization has been around for centuries and there have been several phases that has changed the way Globalization has effected productivity and populations in the various countries - there was the original traders who simply traded goods, then there was the exploiting of countries where cheap goods were bought and resold at vastly higher prices in other countries mostly because of the uniqueness. Buying low in one country using cheap labor and selling high in another has been the backbone of Globalization from the beginning, in the later part of the 20th Century there had been a fast tracking of shipments between countries that lead to a quicker turn-around ( containerization ) in supply but that's about all Globalization has come up with in the last Century, much of the faster supply since the 1990s was due to ITC that sped up communication. The next phase of Globalization for the 21st Century is the shifting away from manufacturing the physical goods in cheap labor countries to manufacturing goods locally in countries where the end Buyers live - regardless of automation changing some industries over the coming decades - the shift is here now with OutSell - trading values can be transferred and tracked seamlessly across borders in real time, and not be constrained as with Outsourced Manufacturing, by the physical transferring of goods across distances. The advantage local industries have is a better focus and control along the Supply Chains where OutSell results in more profits and quicker supply of goods by not needing to operate with credit or trading terms - this is carried through to the local end Buyers where real time Price Demand offers a Free Open Market environment that's highly competitive compared to goods that get outsourced from other countries. The inequality differences in incomes within countries and between countries is so wide, in developing countries the income gap is widening while in developing countries the low income volumes are generally reducing - cross border labor mobility is increasing by those looking to move to countries where there's a better life, and with better incomes - the answer lies in-between - the use of Foreign Direct Investment - FDI, is a system full of corruption and broken dreams when trickle-down economics fails to deliver, with little benefit for those at the bottom - DFDCI is structured to cross borders as a democratic micro-economic Capital Investment without using foreign funding per se, to directly benefit those who need and those who can help make a difference in local economies - the units of account used in tracking the flow of international trade of assets and liabilities are captured and redistributed through the Universal Digital Income portfolios linked to Locations around the world in real-time. The prospect of being rich in a poor country can have enormous impact on people when affordability and better buying power was within the grasp of everyone - compare that to being poor in a rich country and the prospect for people to afford the basics was moving further away - which would they choose? 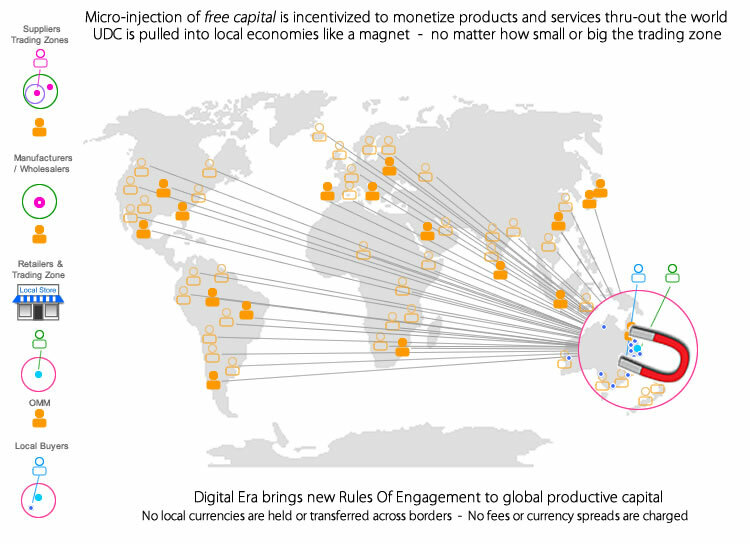 - DFDCI and Free Digital Capital solves that by making it possible for both, as Open Market Merchants - OMMs in rich and poor countries can access the same markets across a borderless world, where values of products and services can now be within the incomes of so many more - a global wealth shift that's far greater than global remittances. This major shift will happen in the workloads for those normally associated with cheap labor in developing countries, much of the workforce will shift to being freelance entrepreneurs who will take over the roles of traders and wholesalers - equipped with just a mobile phone, this massive workforce will be the backbone of OutSelling of products and services needed in countries reliant on local spending for their economies to prosper - there will be a global shift in the way wealth is distributed equitably in the 21st Century. - Subliminal Organic Advertising - SOA provides the global connection with DFDCI by tapping into the real time demand. Cloudfunding's architecture provides local Sellers with this micro-Capital Investment magnet that draws a unique neutral global trading unit of account into a region, and in particular into the pockets of the Sellers and the local economies, automatically and indefinitely, at no cost - Cloudfunding economics has its roots in a similar ideology to an almost forgotten concept that was first proposed over 70 years ago at the Bretton Woods Conference, a global meeting that subsequently changed the world to what we know it today. Cloudfunding changes the way the Supply side of productivity operates by distributing Free Digital Capital to use in OutSell - FDC is a free form of Capital Investment that gets drawn directly into local economies as a micro-Capital Investment by Sellers when they invite Users from around the world to participate in the OutSell of their products and services, which gives Sellers predictability in selling products - FDC perpetually continues to flow around the world from economy to economy as Direct Foreign Digital Capital Investment - DFDCI - all encompassed within the Global Chamber of Economies. The New Economy is the digitization and democratization of the flow of trade through Global Trade and Commerce using the digital means of tracking neutral international units of account, which in some ways is the digitizing of what the IMF has with SDR - SDR a restricted Special Drawing Rights value - a foreign-reserve currency also termed as XDR that is created like quantitative easing but without printing money - its objective has been to replace gold and US Dollars - its role is for IMF member countries to draw down at various costs to exchange between trading countries to balance trade surpluses and deficits. What the New Digital Economy does with Cloudfunding, and in particular with DFDCI, which is validated against genuine global productivity, it modernizes the limited use of SDR by fully democratizing trade, removing the incumbents and opens up global economies to free open markets with a ubiquitous flow of a neutral international trading unit of account value, which the people of the world and countries control and operate with, in real time within the real economies. The paradigm shift with Cloudfunding and Free Digital Capital is that it operates and is governed within post economic activity and productivity value, whereas Modern Banking operates within pre economic activity with credit and is not governed or constrained by actual productivity - Cloudfunding operates on a global scale with true resources to drive global economic growth, without incurring debt. This micro-Capital Investment of Free Digital Capital does something different to how banks and similar services lend money by locking-up what collateral a Seller has, OutSell involves no collateral or equity being given by any party, Seller or Buyer. Most lenders take into account assets such as the plant, chattels and stock but loans primarily are based on what productivity a Seller ( SME ) can achieve so the risk to repay the loan is minimized, all taking weeks, even months. Cloud Commerce takes the dilemma Sellers often have of needing a short term boost in their cash flow, or simply want to just sell their products and services, Cloudfunding can avoid Sellers needing to resort to using costly loans and credit - the Digital Sales Division and Free Direct Backing are new options for Sellers that focus around the Global Open Market Trade Xchange - GOMTX. Cloudfunding works in a new paradigm to how Capital Investment works in the Old Economy, Cloudfunding instigates a process that validates the Free Digital Capital into the Internet's medium of exchange, which's able to be liquidated to any local currency, for free - it provides a new paradigm in stimulating local economies digitally, without taking equity or involving the risk of loans. In some industries and for some businesses the chance of having Price Demand brings real-time demand to the markets. With all commerce activity on the Platform each product and service that's processed with OutSelling and Buying activity - it's linked back through to the Universal Digital Income ( UDI ) Portfolios from where all Users can build a collection of Location Symbols and gain a share of the Location Activity Tax collected and distributed across all the global activity in real time. In any local economy the strength of an economy is based on the velocity of the money moving between Buyers and Sellers, which generates the profit margins that cycle back into the economy - with Cloudfunding, this velocity is generated exponentially on a global scale with the involvement of the Global Crowd, which expands the territory from where the value comes from by e2eCommerce and Trade. The pricing of value has traditionally come down from traders in the global commodity exchanges, what Cloudfunding does is it changes the structure in the way pricing is set in the Supply Chains, so it's sustainable and profitable with all the Suppliers. 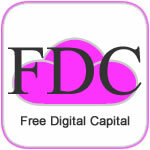 On a larger scale when foreign Capital Investment ( FDI ) comes into a region, it's filtered down slowly to local economies, when OutSell is used by a region's local industries and Sellers, it can scale to any size by drawing in foreign Capital Investment without the costs or loss of control over assets - there's an automatic free Direct Foreign Digital Capital Investment ( DFDCI ) that transfers from around the world directly into the region's local economy, without any transfer of money ( foreign exchange ) being involved - the activity generated in the 'local productivity' creates the validation - this is the Cashless World and Localization. DFDCI is directly connected with the Seller of the product or service, regardless of whether the Seller is located in a small village somewhere or a big city, DFDCI moves from a global environment in micro volumes and comes together as a full payment for each and every product being sold by the Sellers using OutSell, bypassing all the hierarchy and red tape that uses trickle down economics. The transition of advertising, from being part of the mechanics of Commerce, to its distribution as Free Digital Capital, and its validation as free working capital tied to genuine Global Productivity in the Supply and Demand of products and services, through to its final validation as a neutral global Digital Trading Cash - a key to the ongoing perpetual flow of economic growth in the New Economy. The validation is completed when the product is exchanged between the Seller and the local Buyer who only pays the low 20% Buying Price, the balance of payment for the full price is paid by the Global Crowd during the OutSell process - Sellers can then use Pay It Forward to liquidate the Universal Digital Cash to the local currency or use the UDC to buy supplies at low Buying Prices from other Sellers also using OutSell. Liquidating with local Buyers helps spread the Buying Power with local Buyers wanting to have other products at the similar low Buying Prices - the incentive for low prices generates the velocity of commercial activity in the local economy, free of fees and without loans or debt being a burden on the local population - OutSell is capable of operating indefinitely, with the Global Price Index overseeing prices. Cloud Commerce brings Capital Investment and finance closer to real time by giving the Seller the tools to Outsource the Selling ( monetize and liquidate ) of their inventory on a single platform - at no cost, no currency exchange fees or transfer fees. Overall, In the mechanics of OutSell that involves the Global Crowd using Cloudfunds ( free working capital ), it transfers a globally aggregated digital value that is released in the Seller's location only at the exchange of product between the Seller and the Buyer. The use of local fiat currencies only liquidates the digital value into the physical cash during the Pay It Forward, where it helps raise the velocity of cash within a Seller's economy, and validates the increase in the volume of digital cash flowing within the platform's ecosystem, validation of the global transfer of the aggregated digital value occurs prior when the exchange of product takes place. Sellers rarely get the opportunity to control their side of the Supply, what Cloudfunding changes is the scale at which businesses can set the pace that their inventory is sold - Sellers have a new department to operate from, the Seller's Digital Sales Division. It takes it further by providing a customer loyalty program to sellers with a long-tail benefit that follows customers around the world. To help finance businesses and individuals operating in the new digital era, Cloudfunding disrupts the finance industry by introducing Free Digital Capital - it's available to anyone wanting working capital for business or for personal use. For a seller to use Cloud Commerce it only means an online registration to become a TrustBiz entity and paying a small annual fee, from that time a seller can list any quantity of products or services to sell. Cloud Commerce's security mechanics can control the sell all the way to the final exchange over the counter, at no cost. The key purpose of business is to sell an item and earn a profit margin over whatever costs the seller has incurred up to the point of sale ( and sometimes long after ) in exchange for money. The difficulty any seller has is being able to read the supply and demand of their business, the ability of being able to get a controllable and predictable flow of supply coming in to match with the demand of products going out the door. The majority of businesses have vast amounts of stock sitting idle while waiting for the demand to sell the stock, that idle time when product sits still is a loss and when demand is low the next step is to look at discounting. Cloud Commerce avoids that dilemma by involving economies of scale to draw into a local area the demand needed to 'sell' the products, not only sell but to inject outside Capital Investment money from around the world into a local economy. In the typical Capital Investment flow of funds being loaned from a bank these funds are part of how banks create credit out of nothing and a debt is held against the collateral being offered by the borrower, the bank takes into account the amount of funds siphoned in from taking margins from 'productivity' in the region to determine if the region is worth betting on. The money used in the typical bank Capital Investment comes in most cases from the money already flowing around the region and not necessarily new outside money to make the volume of money any bigger, all that happens is a credit and debt added to the volume of money, so no real increase to the volume of wealth to a region because of the debt created. The credit and debt ratio and velocity of money flowing around the region, or more precisely the lack of velocity, is what holds sellers back from investing by supplying more stock and buyers from 'investing' by demanding to buy products. The difference in what Cloud Commerce's Capital Investment Magnet does is it transfers money from outside the region via a global digital exchange made by a Global Crowd ( OMMs ) micro-investing directly into a product being sold by a seller in another region or zone. Value of the micro-Capital Investment is in real money that's already been validated with fiat currency by the Pay It Forward process, it guarantees that the transfer of the digital central currency can be liquidated by the participating seller in their own region as an 'Capital Investment boost' to the size of the region's money pool, using real money. The true volume of fiat currency that's in physical form is estimated to be around 3 to 6% of the amount of credit being used in most developed countries, this means that if all the credit, less the debt, was converted by the people there would be insufficient physical cash available - physical cash is a convenient recognition of value to exchange with a product. - each time UDC is validated with a fiat currency using Pay It Forward it increases the volume of the central currency. The global connection between countries using UDC to invest across borders has a two-fold outcome with commerce activity in a location, it also generates a location activity tax that when combined with all other activities increases the value of UDC, this micro-tax uses the economies of scale to spread wealth with the Universal Digital Income ( UDI ) Portfolios across all the participants in the global commerce activity. - Cloud Commerce's Capital Investment Magnet changes that when economies of scale are applied!